Where is the problem in HealthCare Spending? 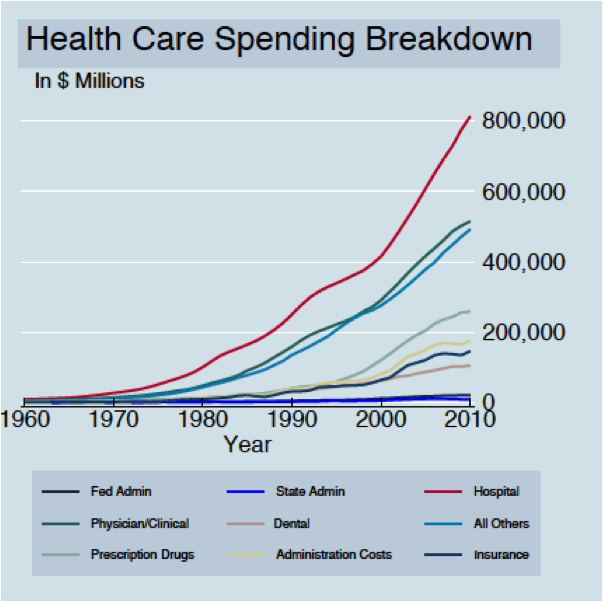 It is obvious to say that healthcare costs have been increasing over the past half century. Something needs to happen to slow the trend, to bend the cost curve back towards earth. Certain avenues may need more attention than others. This graphic breaks down where the dollars are flowing into since 1960 (adapted from data from the Center for Health and Economy). The initial impact from this graphic comes from the Hospital spending – $800 billion is no small figure and the rest of the spending categories pale in comparison to this brontosaurus-like sum. But look at the Administration spending and the Federal Government Administration spending. They are approaching $200 billion each. This sparks an interesting question about where the Administration money is actually going and where it can be cut back. Paul Krugman, Greg Mankiw, and Robert Book have had a lively debate about Medicare administration costs. The author of this post personally sides with Mankiw and Book, but the issue needs investigation. Streamlining federal, state, and private administration can save a large sum of money – if they only became 25% more effective that would save almost $100 billion annually. Not to mention the impact streamlined hospitals could have on savings. Previous post ← You can’t live without it…It’s Electric!